Bumbershoot is a school for Aerial Arts founded in 2009 by Joelle Pendergrass. We are located in South City at 2200 Gravois in SAINT LOUIS, MO. 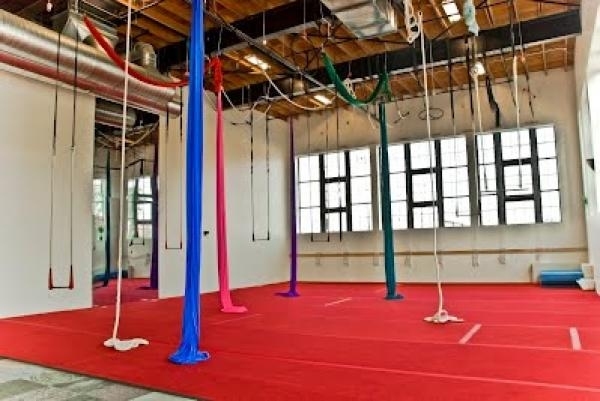 We offer classes in a variety of Aerial Art forms including trapeze, silks, rope, hoop, and more. For more info, check out the class descriptions. We teach classes in all levels and all ages and we specialize in working with beginner adults. Check out our beginner's guide for more info. We teach private lessons in all levels and apparatuses and can schedule them at a time that is convenient for you. We teach private workshops/parties for all levels. Check out our workshops page for more info. Bumbershoot also puts on student showcases that are delightful open to the public.